Wikipedia. A Signing Agent or Courtesy Signer is an agent whose function is to obtain a formal signature of an appearer to a document. In common parlance most jurisdictions require the appearer to sign before a notary public the practice of a notary public designating themselves as a signing agent has arisen. 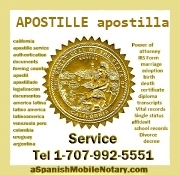 A notary public who specializes in the notarization of real estate transfer and loan document signings. Signing agents often have certification and training through private organizations but is not a requirement in law, but may generally be a requirement of the lender. Also referred to as a Notary Signing Agent or a Loan Signing Agent, a signing agent should not be confused with a mortgage loan closer or closing agent. Signing Agents are notaries public who usually have experience and/or training concerning the proper execution of loan documents and are hired by mortgage companies, escrow companies, title companies, and signing services to identify loan documents, obtain the necessary signatures, and in some cases deliver the documents to the borrower. A Signing Agent is an impartial party to the transaction and must adhere to their state or jurisdiction notary laws. In some states of the United States where Signing Agents are allowed, Signing Agents may identify documents and can point out terms to the loan transaction. However, Signing Agents are prohibited from giving legal advice or in any way explaining or interpreting the meaning of any terms or documents and can not prepare the documents or alter them in any way. Any advice, explanation, or opinion can be considered unauthorized practice of law except in the State of Louisiana which is governed by Civil Law and their Civil Law notaries public have broad powers and can actually prepare documents and discuss them with the signers. We are a group of professional Mobile Notary Signing Agents that are dedicated to our business, and yours. When you contract a notary from our network you can rest assured that you are getting the best in the business, guaranteed. Don’t waste your precious time searching for a notary only to end up with someone inexperienced, because of the luck of the draw. Let us lend you a professional hand; "Count on us to execute all of your signings with a precision born of nearly 50 years of combined experience". All members negotiate their own reasonable rates for their skilled signings. A notary Signing Agent is a Notary Public who is hired as an independent contractor by a “closing agent” to ensure that real estate loan documents are properly executed by the borrower, notarized, and returned for processing. The Notary Signing Agent is a commissioned Notary Public who will notarize all documents requiring it in a typical loan package. Since state law and lenders often require certain forms to be notarized, a valid Notary commission is essential for persons performing loan document signings. The definition further indicates that a Notary Signing Agent is “hired as an independent contractor by a closing agent”. A Notary Signing Agent is not an employee of the lender or title company but is in business independently. Typically, the Notary Signing Agent contracts with the lender or with a title or escrow company in the transaction to perform the signing. We are not attorneys. We do not give legal advice or accept fees for legal advice. 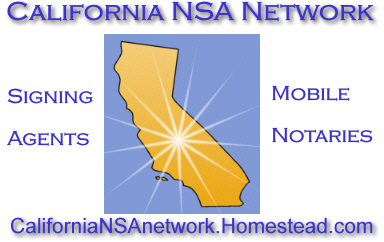 See updated California Mobile Notary Network members.